Satisfy the coffee-lovers at your establishment with these Royal Paper R825B 7" bamboo coffee stirrers. 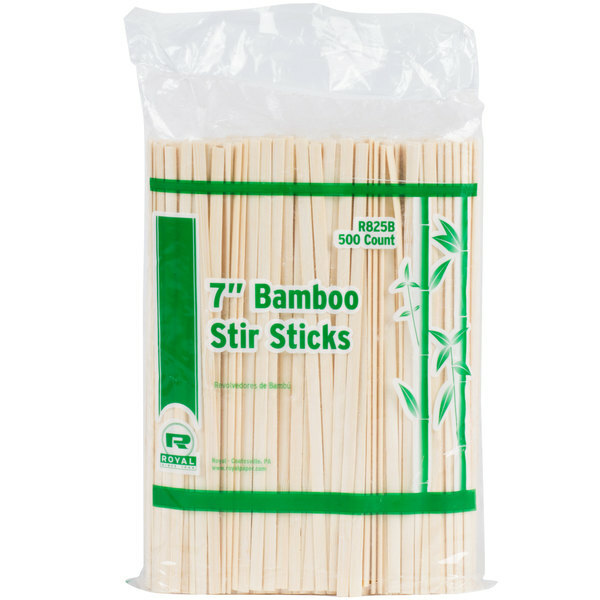 With all-natural visual appeal, sturdiness, and renewability, these bamboo stir sticks offer endless advantages. 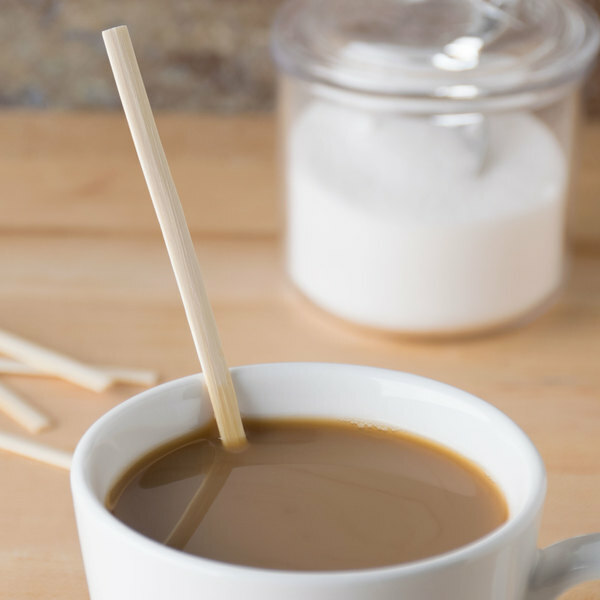 From stirring up lattes and signature teas to adding enhancements to a plain cup of joe, these eco-friendly 7" bamboo stirrers are the perfect, high-quality option for your coffee shop, convenience store, concession stand, or waiting room. "Love theses stirrers. People had commented on not liking the plastic stirrers and some of the wooden ones are a bit flimsy when used in hot liquids. These were a hit at the coffee bar and we will be using these from now on. Very economical too." 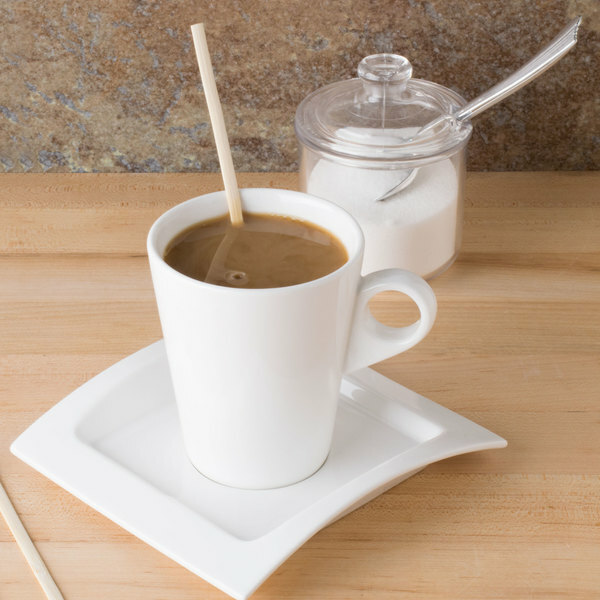 An all-natural option for your coffee service, these stirrers are produced from 100% pesticide- and chemical-free bamboo. In addition, bamboo is a renewable and eco-friendly substitute to other disposable materials, so you can be sure you're always displaying a green initiative to your customers. These stirrers feature a silky-smooth design so your customers can enjoy the natural appearance and feeling, without the worry of getting splinters. 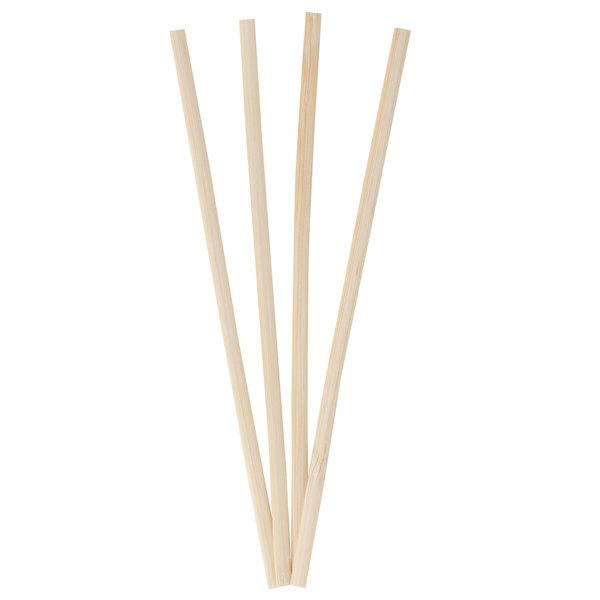 These bamboo stirrers are also stronger and more durable than comparable wooden stirrers, so there's less risk of breakage. Love these little stirrers. I use them to mix product, measure product and for any time I need something disposable to stir product. Will buy again! These are perfect, because the other wooden stir sticks sometimes give splinters. These are nice and smooth! The product arrived in a very timely manner and as expected. We were pleased with these bamboo coffee stirrers. They are a good quality product and we love that they are eco-friendly. We'll definitely continue using them. Look great in the display and do exactly what they say they do. No splintering, smooth and just the right length, decent price for a premium product. These do the job. Perfect for any of your hot drinks and very sturdy. Had these at my rustic wedding at the coffee and tea table. A nice touch for my in house coffee bar. The sticks are a bit more sturdy and longer than other I have seen. Will order again. Although these bamboo coffee stirrers are a little more expensive than the regular wood ones I prefer them. They are sturdy and there are never any splinters. We used to use the plastic stir straws, which has a little more versatility to them, but with going green the Royal Paper R825B 7" Eco-Friendly Bamboo Coffee Stirrers work wonderfully for hot or cold drinks. These stirrers are great! They're strong, the perfect length, and well worth the price tag. An added bonus is that they're made of bamboo, making them a great environmentally-friendly product that not only gets the job done, but helps us move away from buying plastic single-use items. Highly recommended. Sturdy, they reach to the bottom of the cup so everything gets stirred in and they look great. Very cost effective and efficient. These are a great choice for saving money and being eco-friendly. They look much fancier than plastic and people notice that. They fit in my 16 oz fine! This product is very good looking and does the job. It fits the regular cappuccino cup and the price is great too! I also like that it is good for the environment. Recommended! We really like these bamboo coffee stirrers. They are quite basic but quite is good and the price makes is attractive. If you prefer a more natural look and do not want to use plastic coffee stirrers check this product out. These coffee stirrers are absolutely perfect. We are so glad that we bought these by the case. The shipping was cheap and it came quickly. Thank you! Wow! For the price, these are a great value. I dont see or feel any rough edges from the package I received. Sticks are all uniform in size and shape, should do their job with ease. I mean...its a stick that stirs. These are every bit as good as the wood ones plus they are Bamboo. Bamboo is a sustainable item and customers will appreciate it. 7" is also perfect for almost any cup. These are great! So much better than the black plastic ones we had before, those were melting. These also look nice & don't deteriorate in a cup of hot coffee. I love the simplicity and beauty of these bamboo stirrers. They are minimalist and reduce waste. They are perfect for my pop-up coffee and dessert shop.